1. Department of Surgery, University of Colorado Denver, Aurora, CO 80045, USA. 4. Medical Research Center of Guangdong General Hospital, Southern Medical University, Guangzhou 510080, China. Calcific aortic valve disease (CAVD) is characterized by chronic inflammation and progressive calcification in valve leaflets. Aortic valve interstitial cells (AVICs) play a critical role in the pathogenesis of CAVD. Previous studies show that stimulation of Toll-like receptor (TLR) 2 or TLR4 in AVICs in vitro up-regulates the expression of osteogenic mediators. Double-stranded RNA (dsRNA) can activate pro-inflammatory signaling through TLR3, the NLRP3 inflammasome and RIG-I-like receptors. The objective of this study is to determine the effect of dsRNA on AVIC osteogenic activities and the mechanism of its action. Methods and results: AVICs isolated from normal human valves were exposed to polyinosinic-polycytidylic acid [poly(I:C)], a mimic of dsRNA. Treatment with poly(I:C) increased the production of bone morphogenetic protein-2 (BMP-2), transforming growth factor beta-1 (TGF-β1) and alkaline phosphatase (ALP), and resulted in calcium deposit formation. Poly(I:C) induced the phosphorylation of NF-κB and ERK1/2. Knockdown of TLR3 essentially abrogated NF-κB and ERK1/2 phosphorylation, and markedly reduced the effect of poly(I:C) on the production of BMP-2, TGF-β1 and ALP. Further, inhibition of either NF-κB or ERK1/2 markedly reduced the levels of BMP-2, TGF-β1 and ALP in cells exposed to poly(I:C). Conclusion: Poly(I:C) up-regulates the production of BMP-2, TGF-β1 and ALP, and promotes calcium deposit formation in human AVICs. The pro-osteogenic effect of poly(I:C) is mediated primarily by TLR3 and the NF-κB and ERK1/2 pathways. These findings suggest that dsRNA, when present in aortic valve tissue, may promote CAVD progression through up-regulation of AVIC osteogenic activities. Keywords: TLR3, BMP-2, TGF-β1, Calcification, Aortic valve interstitial cells. Calcific aortic valve disease (CAVD) is a common cardiovascular disease in the elderly. In developed countries, one-third of people over age 60 have echocardiographic or radiological evidence of aortic valve calcification, and 10% of them exhibit CAVD . Currently, there is no pharmacological intervention capable of delaying or halting CAVD progression. The pathogenesis of CAVD remains not well understood. This disease was originally thought to be a degenerative disease associated with aging. However, it is becoming increasingly apparent that it is an active process, involving inflammatory and osteogenic activities . Importantly, aortic valve interstitial cells (AVICs), the main cell component of valvular leaflets, are found to differentiate into osteoblast-like cells when being stimulated . In this regard, atherogenic factors and mechanical forces can stimulate AVICs to produce growth factors, matrix proteins and osteogenic mediators . In addition, AVICs produce osteogenic mediators in response to stimulation by cytokines [5, 6], and Toll-like receptor (TLR) agonists [7, 8]. TLRs are pattern recognition receptors for ligands from microbes or host cells . To date, 11 human TLRs have been identified, and each TLR appears to recognize distinct pathogen-associated molecular patterns (PAMPs) and damaged-associated molecular patterns (DAMPs) [10, 11]. For example, TLR4 recognizes lipopolysaccharide and TLR2 recognizes peptidoglycan . Several studies show that stimulation of TLR2 or TLR4 induces the production of osteogenic mediators, such as of bone morphogenetic protein-2 (BMP-2), transforming growth factor beta-1 (TGF-β1) and alkaline phosphatase (ALP), in human AVICs [7, 8, 13, 14]. In addition, endogenous molecules, including oxidized low-density lipoprotein and biglycan, are found to up-regulate the production of osteogenic mediators in human AVICs through mechanisms dependent of TLR2 and/or TLR4 [15, 16]. Thus, innate immunoreceptors regulate AVIC osteogenic responses to PAMPs and DAMPs. Nucleic acids derived from viruses, bacteria and damaged cells are detected by TLR3, 7, 8 and 9 . Double-stranded RNA (dsRNA) is produced by viruses during replication  and endogenously from overlapping convergent transcription of distinct protein-coding genes . DsRNA, which can utilize TLR3, the NLRP3 inflammasome and RIG-I-like receptors for signaling, up-regulates the production of inflammatory cytokines in a variety of cell types . Virus-derived dsRNA is major exogenous RNA which exists as a viral genome or is generated in the cytosol of host cells during replication of positive-strand RNA viruses and DNA viruses including poliovirus, coxsackievirus, encephalomyocarditis virus [17, 20]. Endogenous dsRNA is released from damaged or necrotic cells [21, 22]. Cellular dsRNA released from cardiomyocytes upon injury is capable of inducing robust myocardial cytokine responses through a TLR3-dependent mechanism . Regardless of the source, dsRNA represents a critical factor for the activation of the innate immune system . Indeed, extracellular nucleic acids, including double-stranded forms, act as DAMPs to modulate the inflammatory responses associated with myocardial ischemia-reperfusion injury , autoimmune diseases [25, 26], renal failure , diabetes mellitus  and neurodegenerative disease . Cell damage can occur in aortic valves during the process of calcification and sclerosis [30, 31]. RNA may escape from damaged cells and exerts an effect on neighboring cells. Polyinosinic-polycytidylic acid [poly(I:C)] is a synthetic analog of dsRNA and has been used widely in in vivo and in vitro studies to determine the effect of dsRNA. Several studies show that stimulation of human mesenchymal stromal cells with poly(I:C) promotes their osteogenic differentiation potential . In addition, poly(I:C) has been reported to up-regulate the production of inflammatory mediators, as well as ALP levels, in human AVICs , suggesting a potential role for dsRNA in modulating valvular inflammatory and osteogenic responses. Currently, it is unclear whether dsRNA up-regulates AVIC production of osteogenic mediators through TLR3 and what intracellular signaling pathway mediates the pro-osteogenic effect of dsRNA. Further, it is unknown whether prolonged exposure of AVICs to dsRNA up-regulates cellular pro-osteogenic activity, in terms of in vitro formation of calcium deposits. The present study was designed to determine the effect of poly(I:C) on the production of BMP-2, TGF-β1 and ALP and in vitro formation of calcium deposits in human AVICs, and to test the hypothesis that pro-osteogenic signaling pathways activated by TLR3 mediate the up-regulation of osteogenic mediator production by poly(I:C). Antibodies against BMP-2, TGF-β1, ALP, β-actin and TLR3 were purchased from Santa Cruz Biotechnology, Inc (Santa Cruz, CA). Antibodies against phosphorylated nuclear factor-kappa B (NF-κB), total NF-κB, phosphorylated extracellular-regulated kinase1/2 (ERK1/2) and total ERK1/2 were purchase from Cell Signaling, Inc (Beverly, MA). TLR3-neutralizing antibody was purchased from Enzo Life Science (Farmingdale, NY). Specific small interfering RNA (siRNA) for human TLR3 and scrambled siRNA were purchased from Life Technologies, Inc (Grand Island, NY). HiPerFect transfection reagent and other transfection-related reagents were purchased from Dharmacon (Lafayette, CO). Medium 199 was purchased from Lonza (Walkersville, MD). Enzyme-linked immunosorbent assay kit for interleukin 1β (IL-1β) was purchased from R&D System (Minneapolis, MN). ERK1/2 inhibitor (328000ERK) was purchased from EMD Millipore (Billerica, MA). Poly(I:C) of high molecular weight (1.5-8kb) was purchased from InvivoGen (San Diego, CA). IκB kinase inhibitor (Bay11-7082) and all other chemicals and reagents were purchased from Sigma-Aldrich Chemical (St Louis, MO). This study was approved by the Colorado Multiple Institutional Review Board of the University of Colorado Denver. Normal aortic valve leaflets were collected from the explanted hearts of 6 patients (4 males and 2 females; mean age, 59±8.1 years) with cardiomyopathy and undergoing heart transplantation at the University of Colorado Hospital. All patients gave informed consent for the use of their valves for this study. AVICs were isolated and cultured using a previously described method  with modifications . Briefly, valve leaflets were subjected to an initial digestion with a high concentration of collagenase (2.5 mg/mL) to remove endothelial cells. Then the remaining tissue was treated with a low concentration of collagenase (0.8 mg/mL) to free the interstitial cells. Cells were collected by centrifugation and cultured in M199 growth medium containing penicillin G, streptomycin, amphotericin B, and 10% fetal bovine serum. AVIC isolates obtained using this modified protocol are lack of endothelial cells as verified by von Willebrand factor staining . Cells of passage 4 to 6 were used for this study. Cells were subcultured on plates and treated when they reached 80% to 90% confluence. To determine the effect of poly(I:C) on the production of BMP-2, TGF-β1 and ALP, cells were treated with poly(I:C) (0.5 μg/mL-10 μg/mL) for 24 hours. To examine calcium deposit formation, cells were treated with poly(I:C) (2.5 μg/mL) for 10 days in conditioning medium (growth medium with 10 mmol/L of β-glycerophosphate, 10 nmol/L of vitamin D3, 10 nmol/L of dexamethasone, and 8 mmol/L of CaCl2). Cells were treated with 2.5 μg/mL of poly(I:C) for 2 to 8 hours, and media were collected for analysis of IL-1β. Cells treated with 2.5 μg/mL of poly(I:C) for 30 minutes to 24 hours were analyzed for the phosphorylation of NF-κB and ERK1/2. To determine the role of NF-κB and ERK1/2 pathways in BMP-2, TGF-β1 and ALP production, cells were treated with ERK1/2 inhibitor 328000ERK (40 μmol/L) or IκB kinase inhibitor Bay11-7082 (2.5 μmol/L) 1 hour prior to treatment with poly(I:C). To determine the role of TLR3 in the effect of poly(I:C) on osteogenic mediator production, TLR3-neutralizing antibody (20 μg/mL) was added to culture medium 1 hour prior to treatment with poly(I:C). TLR3 knockdown with specific siRNA was performed to confirm the results from the experiments using TLR3-neutralizing antibody. TLR3 knockdown with specific siRNA was also performed to determine the role of TLR3 in the effect of poly(I:C) on NF-κB and ERK1/2 phosphorylation. 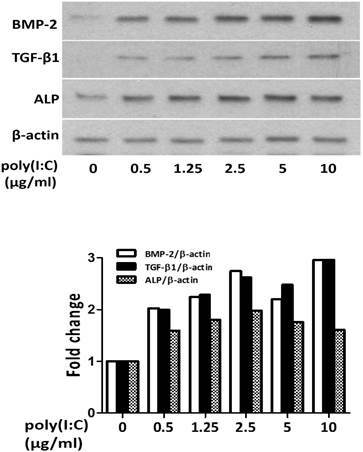 Western blotting was applied to analyze BMP-2, TGF-β1, ALP, TLR3, phosphorylated and total ERK1/2, and phosphorylated and total NF-κB with β-actin as a loading control. After stimulation, human AVICs were lysed in a sample buffer (100 mmol/L Tris-HCl, pH 6.8; 2% SDS; 0.02% bromophenol blue; and 10% glycerol). Protein samples were separated on gradient (4%-20%) mini-gels and transferred onto nitrocellulose membranes (Bio-Rad Laboratories, Hercules, CA). The membranes were blocked with 5% skim milk solution for 1 hour at room temperature. The blocked membranes were incubated with primary antibody. After washing with phosphate-buffered saline containing 0.05% Tween 20, the membranes were incubated with a peroxidase-linked secondary antibody specific to the primary antibody. After further washes, membranes were treated with enhanced chemiluminescence reagents. Then the membrane was exposed on x-ray film. Band density was analyzed using the National Institutes of Health Image J software (Wayne Rasband, National Institutes of Health, Bethesda, MD). To knockdown TLR3, cells (60%-70% confluent) in 24-well plates were incubated with a mixture of siRNA (150 nmol/L) and transfection reagent (6.0 μL per mL of medium) for 72 hours and then stimulated with poly(I:C). Control cells were treated with scrambled siRNA (150 nmol/L) and transfection reagent. Alizarin red S staining for calcium deposits was performed as described previously . Briefly, cell monolayers were washed twice with PBS and fixed for 15 minutes in 4% paraformaldehyde followed by incubation with 0.2% alizarin red S solution (PH 4.2) for 30 minutes. Excessive dye was removed by washing with distilled water. Alizarin red S staining was examined and photographed with a Nikon Eclipse TS100 microscope (Tokyo, Japan). To quantitatively analyze alizarin red stain, wells were rinsed with distilled water, and alizarin red S stains were bleached with 10% acetic acid at 85°C. Supernatant was spectrophotometrically analyzed at 450 nm . Cell culture supernatants were collected. Level of IL-1β was analyzed using an ELISA kit (R&D System, catalog number DY201) following the manufacturer's protocol. Absorbance of standards and samples were determined spectrophotometrically at 450 nm, using a microplate reader (Bio-Rad Laboratories, Inc, Hercules, CA). Results were plotted against the linear portion of a standard curve. All data are presented as mean ± standard error (SE). Statistical analysis was performed using StatView software (Abacus Concepts, Calabasas, CA). Student's t-test was used for comparison between two groups. ANOVA with the post hoc Bonferroni/Dunn test was used to analyze differences between multiple groups. Statistical significance was defined as P≤0.05. Nonparametric Mann-Whitney U test was performed to confirm the difference of the 2 group comparison. For multiple group comparisons, nonparametric Kruskal-Wallis test was performed to confirm the differences. First, we determined the effect of dsRNA in varied concentrations on osteogenic mediator production in human AVICs. We analyzed the levels of BMP-2, TGF-β1 and ALP in cell lysate after poly(I:C) treatment. As shown in Figure 1, treatment with poly(I:C) at 0.5-10 μg/mL resulted in a dose dependent increase in protein levels of BMP-2, TGF-β1 and ALP. A concentration of 2.5 μg/mL appeared to induce a maximal increase in these osteogenic mediators. To examine whether prolonged treatment with poly(I:C) induces calcium deposit formation in vitro, we treated AVICs with 2.5 μg/mL of poly(I:C) for 10 days in the conditioning medium (growth medium with 10 mmol/L of β-glycerophosphate, 10 nmol/L of vitamin D3, 10 nmol/L of dexamethasone, and 8 mmol/L of CaCl2). We applied Alizarin red S staining to detect calcium deposits. As shown in Figure 2, prolonged treatment with poly(I:C) promoted calcium deposit formation. Spectrophotometric analysis of bleached stains confirmed a 4 fold increase in cells treated with poly(I:C) (Figure 2A). Treatment of AVICs with this concentration of poly(I:C) in normal growth medium for 24 hours increased the levels of BMP-2, TGF-β1 and ALP by 2.3, 2.2 and 1.8 folds, respectively (Figure 2B). Together, these results show that dsRNA promotes osteogenic activities in human AVICs and that the formation of calcium deposits is associated with the up-regulated expression of BMP-2, TGF-β1 and ALP. Poly(I:C) up-regulates the production of BMP-2, TGF-β1 and ALP in human AVICs in a dose-dependent fashion. AVICs isolated from normal human aortic valves were treated with varied concentrations of poly(I:C) for 24 hours. Representative immunoblots of three separated experiments and normalized densitometric data show that poly(I:C) in a dose range of 0.5-10 μg/mL increases BMP-2, TGF-β1 and ALP levels in human AVICs. While 0.5 μg/mL of poly(I:C) increases the levels of these osteogenic factors, 2.5 μg/mL results in maximal changes. No apparent further change is induced by poly(I:C) at a concentration greater than 2.5 μg/mL. DsRNA has been reported to induce robust immune responses in mouse bone marrow-derived dendritic cells and macrophages, and the human monocyte cell line THP-1 via NLRP3 inflammasome . To determine whether dsRNA activates NLRP3 inflammasome in human AVICs, we analyzed the release of IL-1β after treatment of cells with poly(I:C). 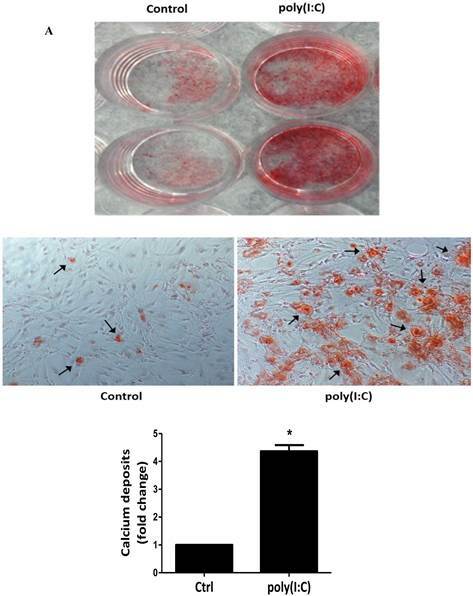 As shown in Figure 3, the levels of IL-1β in culture media were fairly low (30 pg/mL or lower) in cells treated with poly(I:C) and those of untreated control. The difference between cells treated with poly(I:C) and those of untreated control was insignificant although a slight increase was observed after treatment with poly(I:C). As IL-1β production/release is mediated primarily by the NLRP3 inflammasome, the results indicate that dsRNA is incapable of activating the NLRP3 inflammasome in human AVICs. Poly(I:C) induces calcium deposits formation that is associated with elevated production of BMP-2, TGF-β1 and ALP. AVICs isolated from normal human aortic valves treated with 2.5 μg/mL poly(I:C) for varied period of time. A. Representative images and data from spectrophotometric analysis show that treatment of AVICs with poly(I:C) in conditioning medium (growth medium with 10 mmol/L of β-glycerophosphate, 10 nmol/L of vitamin D3, 10 nmol/L of dexamethasone, and 8 mmol/L of CaCl2) for 10 days promotes the formation of calcium deposits. B. Representative immunoblots and normalized densitometric data show that treatment of AVICs with 2.5 μg/mL of poly(I:C) in normal growth medium for 24 hours up-regulates the production of BMP-2, TGF-β1 and ALP. Data are presented as mean ± standard error of 6 experiments using different AVIC isolates; *P<0.05 vs. untreated control (Ctrl). Poly(I:C) has a minimal effect on the release of IL-1β. AVICs were treated with 2.5 μg/mL of poly(I:C) for 4, 8 and 24 hours, and cell culture supernatants were collected to analyze IL-1β with ELISA. No significant change in IL-1β levels is observed after poly(I:C) stimulation. Data are presented as mean ± standard error of 6 experiments using different AVIC isolates. DsRNA activates TLR3 in a variety of cell types [36, 37]. We applied two approaches to test the hypothesis that poly(I:C) induces the osteogenic responses in human AVICs mainly through TLR3. First, we applied a specific antibody to block this receptor. 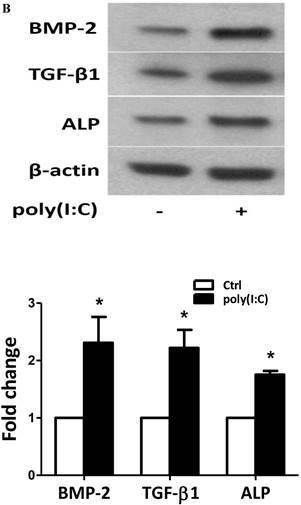 As shown in Figure 4A, TLR3-blocking antibody abrogated the effect of poly(I:C) on the production of BMP-2, TGF-β1 and ALP while control IgG had no effect. Then, we applied specific human TLR3 siRNA to knockdown this receptor. The results are shown in Figure 4B. TLR3 knockdown also abolished the effect of poly(I:C) on the production of BMP-2, TGF-β1 and ALP. However, scrambled siRNA did not affect the levels of these osteogenic mediators in cells exposed to poly(I:C). The results demonstrate that TLR3 plays a major role in up-regulation of BMP-2, TGF-β1 and ALP by dsRNA in human AVICs. DsRNA activates multiple pro-inflammatory signaling pathways, including the ERK1/2, p38 MAPK, NF-κB and IRF3 pathways. NF-κB and ERK1/2 pathways have previously been shown to play important roles in the regulation of osteoblast activity , and our previous studies confirmed that these two signaling pathways mediate human AVIC osteogenic responses to lipopolysaccharide and biglycan [14, 15]. We analyzed the phosphorylation of NF-κB and ERK1/2 after treatment of human AVICs with poly(I:C) and noted that poly(I:C) induced rapid phosphorylation of both NF-κB and ERK1/2 (Figure 5A). The levels of phospho-ERK1/2 increased at 30 minutes of poly(I:C) exposure and remained elevated at 8 hours. Similarly, phospho-NF-κB increased after treatment with poly(I:C) for 1 hour and was still detectable in cells treated for 4 hours. TLR3 mediates the up-regulation of BMP-2, TGF-β1 and ALP production by poly(I:C). AVICs were pre-treated with monoclonal TLR3-blocking antibody (clone TLR3.7, 20 μg/mL; non-immune mouse IgG for control) 1 hour before poly(I:C) stimulation or pre-treated with TLR3 siRNA (150 nmol/L; scrambled siRNA as control) 72 hours before poly(I:C) stimulation. Representative immunoblots and densitometric data show that blocking TLR3 with the antibody (A) and TLR3 knockdown (B) suppress the production of BMP-2, TGF-β1 and ALP induced by poly(I:C). Data are presented as mean ± standard error of 6 experiments using different AVIC isolates; *P<0.05 vs. untreated control (Ctrl); #P<0.05 vs. poly(I:C) alone; ΔP<0.05 vs. poly(I:C)+non-immune IgG; &P<0.05 vs. poly(I:C)+scrambled siRNA. 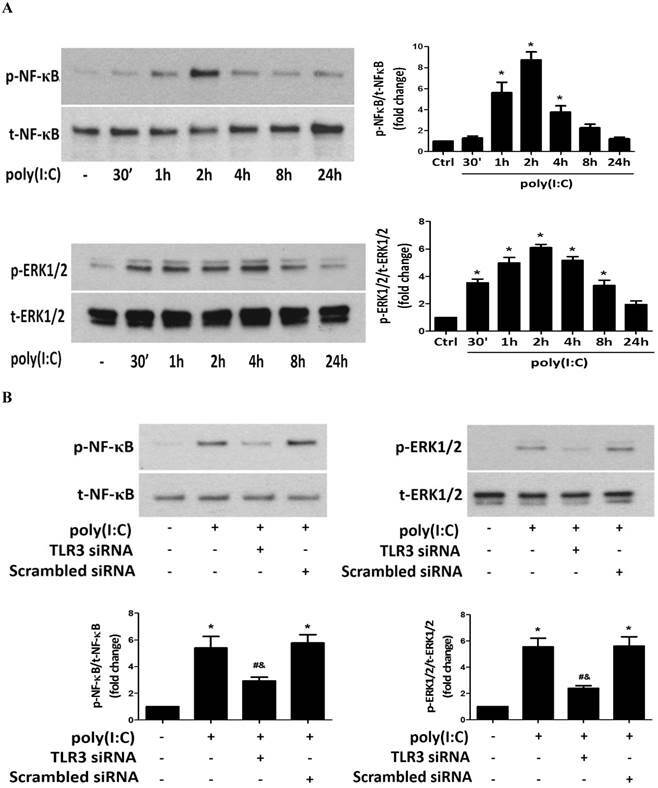 Poly(I:C) induces the phosphorylation of NF-κB and ERK1/2 in human AVICs via TLR3. A. AVICs were treated with 2.5 μg/mL of poly(I:C) for 30 minutes to 24 hours. Representative immunoblots and densitometric data show that treatment with poly(I:C) increases the levels of phospho-NF-κB and phospho-ERK1/2 at 1 hour and 30 minutes, respectively. Phospho-NF-κB is detectable at 4 hours, and phosphorylation levels of ERK1/2 remain elevated at 8 hours in AVICs after being exposed to poly(I:C). B. AVICs were treated with TLR3 siRNA (150 nmol/L; scrambled siRNA as control) 72 hours prior to poly(I:C) stimulation for 2 hours. Representative immunoblots and densitometric data show that treatment with TLR3 siRNA markedly reduces the levels of phospho-NF-κB and phospho-ERK1/2 in cells stimulated with poly(I:C). Data are presented as mean ± standard error of 6 experiments using different AVIC isolates; *P<0.05 vs. untreated control (Ctrl); #P<0.05 vs. poly(I:C) alone; &P<0.05 vs. poly(I:C)+scrambled siRNA. To determine whether TLR3 mediates poly(I:C)-induced NF-κB and ERK1/2 phosphorylation, we stimulated cells with poly(I:C) for 2 hours with or without prior knockdown of TLR3. The results in Figure 5B show that TLR3 knockdown markedly reduced NF-κB and ERK1/2 phosphorylation. Thus, TLR3 mediates NF-κB and ERK1/2 activation by poly(I:C) in human AVICs. To determine the role of ERK1/2 and NF-κB in poly(I:C)-induced production of BMP-2, TGF-β1 and ALP, we applied specific inhibitors before treatment of cells with poly(I:C). Inhibition of NF-κB with Bay11-7082 or inhibition of ERK1/2 with 328000ERK essentially abolished the effect of poly(I:C) on the production of BMP-2, TGF-β1 and ALP (Figures 6A and 6B). 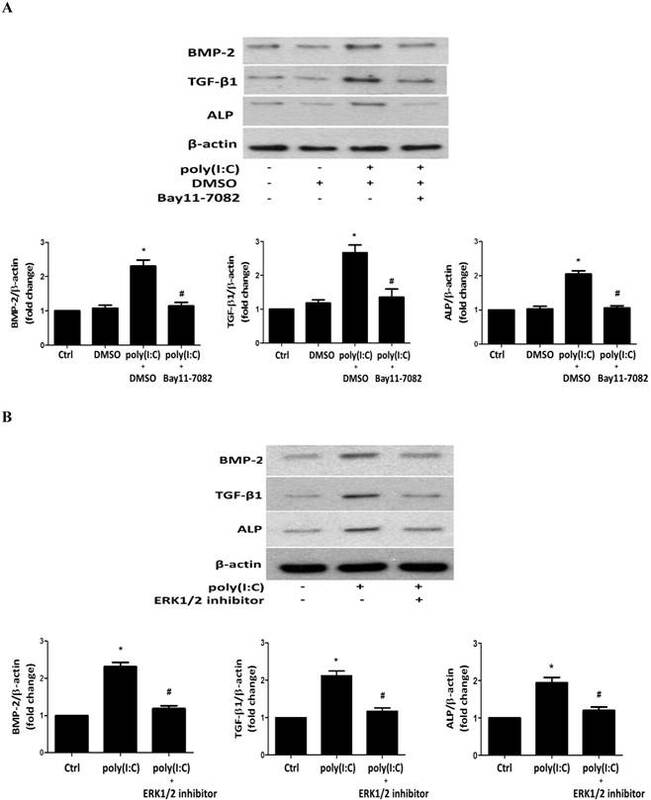 It appears that concurrent activation of the NF-κB and ERK1/2 pathways is required for up-regulation of the production of these osteogenic mediators by poly(I:C). Both NF-κB and ERK1/2 are required for the up-regulation of the production of BMP-2, TGF-β1 and ALP by poly(I:C). AVICs were treated with IκB kinase inhibitor (Bay11-7082, 2.5 μmol/L) or a specific ERK1/2 inhibitor (328000ERK, 40 μmol/L) 1 hour prior to poly(I:C) stimulation for 24 hours. Representative immunoblots and densitometric data show that inhibition of either NF-κB (A) or ERK1/2 (B) abrogates the effect of poly(I:C) on BMP-2, TGF-β1 and ALP production. Data are presented as mean ± standard error of 6 experiments using different AVIC isolates; *P<0.05 vs. untreated control (Ctrl); #P<0.05 vs. poly(I:C) alone or poly(I:C)+DMSO. CAVD is a common cardiovascular disease in the elderly. Chronic inflammatory and calcification processes in valve leaflets eventually result in valvular failure. Currently, no pharmacological intervention is available for prevention of the progression of this disease. AVIC osteogenic responses are critical for aortic valve calcification . However, the molecular mechanism underlying AVIC osteogenic responses remains incompletely understood. In this study, we found that poly(I:C), a synthetic analog of dsRNA, is capable of up-regulating the production of BMP-2, TGF-β1 and ALP in human AVICs through TLR3-mediated activation of the NF-κB and ERK1/2 pathways. DsRNA derived from viruses or of endogenous origin is a potent modulator of cell function involved in antiviral defense and in innate and adaptive immunity responses . Carotid and coronary arteriosclerosis have been found to be associated with viral infection . In this regard, nucleic acids have been detected within arteriosclerotic lesions and can evoke inflammatory responses in cultured vascular cells . It remains unknown whether viral infection and viral dsRNA are involved in the pathogenesis of CAVD. However, cell damage associated with valvular calcification and/or sclerosis may result in the release of endogenous dsRNA. A recent study reported that treatment of human AVICs with a high concentration (10 µg/mL) of poly(I:C) in vitro induces the expression of cyclooxygenase-2, prostaglandin E2 and intercellular adhesion molecule-1 . Interestingly, elevated ALP levels are also observed in cells exposed to this concentration of poly(I:C), indicating a pro-osteogenic effect of dsRNA on human AVICs. In the present study, we confirmed that a much lower concentration (0.5 µg/mL) of poly(I:C) is capable of up-regulating ALP production in human AVICs. In addition, we noted treatment of human AVICs with poly(I:C) markedly increases cellular levels of osteogenic mediators BMP-2 and TGF-β1. More importantly, we observed that human AVICs form calcium deposits if they are exposed to poly(I:C) in a pro-osteogenic medium for 10 days. Thus, dsRNA not only up-regulates the production of osteogenic mediators in human AVICs, but also promotes the osteogenic activity expressed as the in vitro formation of calcium deposits. The results demonstrate that dsRNA is pro-osteogenic to human AVICs. It should be noted that the AVICs used in this study were isolated from aortic valves without apparent abnormalities. However, the valve leaflets were from hearts affected by cardiomyopathies, and the diseases and heart failure may have a potential effect on aortic valves and AVICs. We obtained aortic valve leaflets from 3 healthy donor hearts that were not usable for heart transplantation and observed no difference between cells from aortic valves of healthy hearts and cells from aortic valves of hearts with cardiomyopathies in terms of cellular morphology, phenotypic characteristics and the osteogenic responses to stimulation. Thus, the results of this study demonstrate that dsRNA induces osteogenic responses in AVICs of normal human aortic valves. DsRNA is generally considered to be a TLR3 ligand. However, other pattern recognition receptors, including retinoic acid inducible gene I (RIG-I)-like receptors (RLRs), and protein kinase R (PKR) can interact with dsRNA as well [41, 42]. In addition, NLRP3 inflammasome complex has been reported to sense extracellular dsRNA . Our results show a minimal effect of poly(I:C) on IL-1β secretion by human AVICs, indicating that poly(I:C) has no significant effect on NLRP3 inflammasome in this cell type. However, results from experiments using two distinct approaches show a major role of TLR3 in mediating the pro-osteogenic effect of poly(I:C) on human AVICs. First, a specific TLR3-blocking antibody abrogates the effect of poly(I:C) on the production of BMP-2, TGF-β1 and ALP. Further, treatment with specific TLR3 siRNA markedly reduces TLR3 protein levels and also abrogates the effect of poly(I:C) on the production of BMP-2, TGF-β1 and ALP. Together, these results demonstrate that poly(I:C) exerts its pro-osteogenic effect on human AVICs through TLR3. The specificity of dsRNA recognition by pattern recognition receptors is related to dsRNA molecular size. TLR3 has been reported to recognize dsRNA ligand longer than 40bp , and melanoma differentiation-associated gene 5 (MDA5) also recognizes long dsRNA . Poly(I:C) is a large dsRNA-like complex consisting of synthetic polymers, and the different preparations vary in the strand lengths and biological functions . Long poly(I:C) is found to preferentially elicit cytokine production in fibroblasts or epithelial cells, but has a moderate effect on myeloid cells . As human AVICs are fibroblasts and myofibroblasts, we applied poly(I:C) of high molecular weight (1.5-8kb) and found that this preparation of poly(I:C) induces the osteogenic responses in human AVICs through TLR3. Further studies are needed to compare the effect of poly(I:C) of different lengths. It is not clear from the present study whether up-regulated production of BMP-2 and TGF-β1 are responsible for the increased levels of ALP and/or the increased formation of calcium deposits. However, BMP-2 and TGF-β1 are important osteogenic mediators and contribute to the mechanism of aortic valve and vascular calcification [47, 48]. BMP-2 and TGF-β1 accumulation in valve leaflets is evident in the early stage of CAVD [30, 49]. Stimulation of human AVICs with recombinant BMP-2 in vitro up-regulates ALP expression and induces calcification nodule formation . TGF-β1 is capable of inducing AVIC calcification as well . It is likely that the up-regulated production of BMP-2 and TGF-β1 in response to dsRNA stimulation plays an important role in elevation of ALP levels and the in vitro osteogenic activity. Pattern recognition receptors recognize dsRNA and recruit adaptor proteins to activate downstream signaling molecules. It has been demonstrated that the NF-κB and ERK1/2 pathways are involved in osteoblast differentiation and function . Our previous studies have shown that these two pathways play a role in mediating BMP-2 and ALP expression by human AVICs exposed to lipopolysaccharide or biglycan [14, 15, 52]. The results of the present study show that poly(I:C) induces rapid phosphorylation of NF-κB and ERK1/2 in human AVICs and that levels of phospho-NF-κB and phospho-ERK1/2 remain elevated after 4 or 8 hours of poly(I:C) stimulation. The results of the experiments using TLR3 siRNA show markedly reduced phosphorylation of these two signaling molecules following poly(I:C) treatment, suggesting an important role of TLR3 in the activation of these signaling pathways in human AVICs exposed to poly(I:C). TLR3 utilizes TRIF to activate TNF receptor-associated factor 6 (TRAF6), interferon regulatory factor 3 (IRF3) or receptor-interacting protein 1 (RIP1), and activation of any of these pathways can result in the activation of NF-κB and MAP kinases . It is unclear from this study which pathway is involved in TLR3-mediated activation of NF-κB and ERK1/2. Further study is needed to address this question. It appears that TLR3 mediates the production of BMP-2, TGF-β1 and ALP induced by poly(I:C) by activation of the NF-κB and ERK1/2 pathways. To confirm the role of NF-κB and ERK1/2 in the up-regulation of BMP-2, TGF-β1 and ALP production by poly(I:C), we applied specific inhibitors to inhibit NF-κB and ERK1/2. Inhibiting either of these two pathways markedly reduces the effect of poly(I:C) on BMP-2, TGF-β1 and ALP levels. Thus, both NF-κB and ERK1/2 are involved in the up-regulation of BMP-2, TGF-β1 and ALP production by poly(I:C). It appears that concurrent activation of both signaling pathways is required for the TLR3-mediated up-regulation of osteogenic mediator production in human AVICs. It should be noted, however, that NF-κB and ERK1/2 could be interrelated in mediating the osteogenic responses since ERK1/2 can modulate NF-κB activity . Further study is needed to determine the relationship of these two signaling pathways in mediating the pro-osteogenic effect of dsRNA on human AVICs. Our finding with regard to the role of NF-κB is different from the study by Lopez and colleagues in which inhibition of NF-κB with a NF-κB p50-specific inhibitor (SN50) fails to reduce the inflammatory response in human AVICs treated with a high concentration of poly(I:C) . The difference could be mainly due to the application of distinct NF-κB inhibitors. We applied Bay11-7082, a specific inhibitor of IKK that is responsible for NF-κB activation. However, SN50 selectively prevents NF-κB p50 migration into the nucleus. It has an effect only when a significant amount of active NF-κB is heterodimer containing a p50 subunit. In addition, it is possible that the NF-κB pathway becomes less important in mediating AVIC responses when cells are stimulated with a much higher concentration of poly(I:C). CAVD is a common cardiovascular disease in the elderly. Currently, there is no pharmacological intervention capable of halting CAVD progression. The pro-osteogenic effect of dsRNA may promote aortic valve calcification and thus contributes to the mechanism underlying CAVD progression. Understanding of the role of the innate immunoreceptor in regulating AVIC osteogenic responses may help in identification of therapeutic targets for pharmacologically halting CAVD progression. It should be noted, however, that the low concentration of dsRNA used in this study is not an approximation of the dsRNA concentration in human aortic valve tissue. As the concentration of dsRNA in valvular tissue is currently unknown, and it may vary in the different stages of calcific aortic valve disease and among the micro-environments surrounding aortic valve interstitial cells, the results of this study should be interpreted in the context of the experimental conditions. Poly(I:C), a mimic of dsRNA, up-regulates the production of BMP-2, TGF-β1 and ALP, and promotes calcium deposit formation in human AVICs. Poly(I:C) exerts its pro-osteogenic effect on human AVICs primarily through TLR3, and the NF-κB and ERK1/2 pathways. These findings demonstrate that activation of TLR3 on human AVICs can up-regulate their osteogenic activities. CAVD: calcific aortic valve disease; AVICs: aortic valve interstitial cells; TLR: Toll-like receptor; RNA: ribonucleic acid; dsRNA: Double-stranded RNA; NLRP3: nucleotide-binding oligomerization domain like receptor family, pyrin domain containing 3; RIG-I: retinoic acid inducible gene I; poly(I:C): polyinosinic-polycytidylic acid; BMP-2: bone morphogenetic protein-2; TGF-β1: transforming growth factor beta-1; ALP: alkaline phosphatase; NF-κB: nuclear factor kappa B; ERK1/2: extracellular signal-regulated protein kinases 1/2; PAMPs: pathogen-associated molecular patterns; DAMPs: damaged-associated molecular patterns; IL: interleukin; siRNA: small interference RNA; IκB: inhibitor of kappa B; ELISA: Enzyme-linked immunosorbent assay; RLR: retinoic acid inducible gene I-like receptors; PKR: protein kinase R; MDA5: melanoma differentiation-associated gene 5; TRIF: toll/interleukin-1 receptor domain-containing adaptor inducing interferon-β; IRF3: Interferon regulatory factor 3; TRAF: tumor necrosis factor receptor associated factor; RIP1:receptor-interacting protein 1; MAPK: mitogen-activated protein kinases. This study was supported in part by the Heart, Lung and Blood Institute grant HL106582. Corresponding author: Xianzhong Meng (xianzhong.mengedu) or Dingli Xu (dinglixuedu.cn).